At last! After creating abuzz on the internet and social media and kept everyone guessing, the hunk behind that large intriguing billboard on EDSA with those luscious lips has finally been revealed! 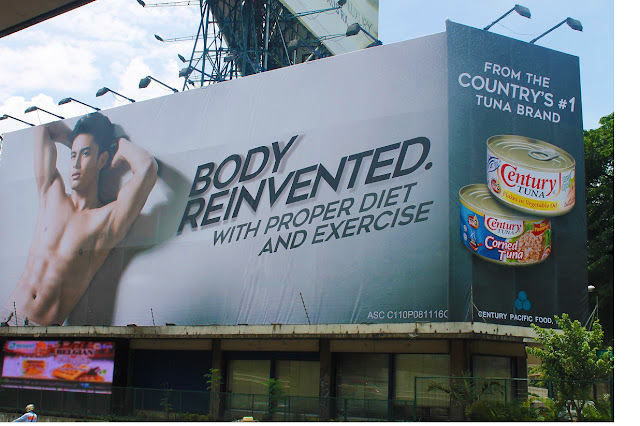 Yes, James Reid is the latest endorser of Century Tuna featured in a traffic-stopping EDSA billboard and a sizzling new television commercial, now airing, that teasingly highlights his totally hot and chiseled bod. Actually, the TVC and billboard is part of an all-new advertising campaign created around the idea of transformation and metamorphosis, where James proudly joins the illustrious company of Anne Curtis and Derek Ramsay. And why James Reid? Well, it’s pretty evident that from the time he entered showbiz six years ago through the Pinoy Big Brother Teen Clash to the present, he’s really been able to transform himself—in terms of his private life, career and of course his physique! While others would probably turn complacent and simply rest on their achievements, James continues to further himself and his craft. He’s clearly more self-confident now and has since shed his timid persona and his lanky build. He hits the gym regularly, where weightlifting is his preferred workout, and maintains a balanced diet consisting of good carbs, no rice, and, of course, Century Tuna. It’s no secret that James has had a string of box-office hits to his name (Diary ng Panget and Talk Back and You’re Dead), a much-watched teleserye (On The Wings of Love, which enjoyed top ratings during its run), a highly popular loveteam in JaDine, plus a Platinum album to boot and a new teleserye Till I Met You, all while keeping his feet firmly on the ground. So what’s not to love about him? Together with this new ad campaign for Century Tuna, we can surely look forward to seeing James in other exciting events and appearances in the coming days.